While it may sound awesome to be part of the 'Black List', like something out of a spy movie, it's, unfortunately, a far cry from that when it comes to online gambling. 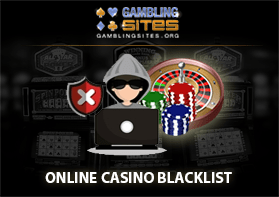 An online gambling site that is blacklisted is a site that you should avoid like the plague. For one reason or another (that we will cover in depth here), the site is not to be trusted and poses a direct threat to your online safety, the safety of your personal information, and the safety or your hard earned money. Now, if you have any experience with the term Blacklist, you know that it usually denotes a complete list of companies, groups, or individuals deserving to be on the list. The problem with online gaming is that there are so many players in the industry coming and going that it is nearly impossible to keep a complete list of sites to avoid. With that being said, it certainly does not mean that we shouldn't try. Included on this page will be the most complete list of blacklisted sites available that we will constantly be updating to keep as current as possible. In addition to this, we will be explaining to you how and why a site could and should get blacklisted and how to spot some of these sites on your own. These money traps posing as legitimate online operations are usually riddled with red flags that are easy to spot if you know what you're looking for. Our goal with this guide is to do our best to protect you from the sites and companies that don't have your best interests at hand. Our first line of defense will be supplying the most complete and up to date list of blacklisted sites currently operating worldwide. As that is only the tip of the iceberg, we'll also do our best to educate you and give you the tools to spot sites you should avoid. Thoroughly reading and bookmarking this page may be the single most profitable move you ever make in gambling or sports betting. The whole goal of this site is to make sure you have the best possible online gambling experience and to make sure you are more informed when it comes to selecting casinos. I cannot stress it enough; THESE CASINOS ARE NOT FOR YOU! Your money is important to you and to us. Don't waste it by experimenting with garbage casinos. In this section we have compiled an extensive list of all Online Casino's that you should avoid. All of the following casinos have been blacklisted by us for the following reasons. Other reasons could include terrible customer service, unresponsiveness, lousy software, or an inability to keep customer information safe. Our most valuable asset in creating a list like this is honest feedback from you, our readers. If you have gone through this list and are shocked to see sites that are not counted among the dastardly which you think warrant blacklisting, please feel free to contact us and we will look into it. We at gamblingsites.org are aware that not all aspiring bettors are interested in casino games. For many of you, betting is just an add on to you passion for sports. It adds excitement to that long awaited championship game and pads your pockets along the way. Sadly, there are several snakes in the grass when it comes to sportsbetting and we've taken it as our duty to weed them out. Your safety is important to us and regardless of what sport or esport you follow we refuse to let your fun be ruined by cons. All the following sportsbooks have been blacklisted either for payment issues, illegitimate licensing, false advertising, or other urgent concerns in the same way they were for the casinos above. Again, if you are aware of other no good sportsbooks flying below our radar please feel free to let us know. The first thing we want to do is educate you on the reasons a casino or sportsbook might find its way onto our blacklist. The reason for this information is that it will provide you with a working knowledge base on the topic and an explanation as to why we have listed certain sites. It will also give us a strong starting point to better and more effectively teach you how to spot online gambling sites to avoid. The best part about gambling or betting is winning! When we win, we want to be able to enjoy our money and spoils as quickly as possible. Online casinos and sportsbooks have come a long way since their infant days where cashouts took weeks. Today, you can get your money in hours or a few days...if you're playing at a reputable site. This is probably the most annoying and also scariest reasons on this list. It's the most annoying because it's your money and you deserve to get it when you want it. Most sites online are great about this and will get you paid quickly and easily. However, some bad apples can't seem to get their act together and can take weeks and sometimes longer to pay you out. 2Give you excuses about why your money is delayed. Trust us, we've heard every excuse in the book, and exactly zero of them are good ones. The second problem and what makes this the scariest reason on the list is that slow payment is usually a sign of bigger problems. In some instances, online sites pay slowly because they have terrible processes set up, are understaffed, or are just plain lazy. This is when things fall into the annoying category. Your money is coming, but just on their schedule. In other instances, though, online sites are slow to pay because of financial issues. They may have issues with their payment processors, may have mixed player funds with operating funds and spent too much, or may be running a shady operation. Regardless of the exact reason, it's unacceptable. We feel that any site with payment issues for ANY reason does not deserve your business and earns a prominent spot atop the blacklist. There are plenty of sites that pay quickly and efficiently, so there is no reason to give any of these slow payers the time of day. This is the evil cousin of the above reason. There have been some sites in the past that have not paid customers for one reason or the other. Usually, this is still under the realm of slow payment, but once it crosses a certain time frame, we start to think that the money isn't coming and classify it as non-payment. There are also some instances where sites owe players money and because of some sort of dispute will choose not to pay them because they say the player violated some certain rules or terms of service. Now, if the player did, in fact, do so (maybe they cheated or tried to take advantage of the system unethically), then we're going to side with the site every time. But, if it's of no fault of the player, then the site will instantly find itself on our blacklist. We can't stress this enough, you deserve to be paid your winnings, and you deserve to be paid quickly and reliably. You're probably noticing that a lot of these reasons we blacklist sites have to do with the same reasons you wouldn't use other companies in other industries. If a donut shop told you that a dozen donuts were $5 and you got there and it was $10, you'd be upset, and you'd probably leave and never shop there again. Sadly, the problem of false advertisement is not limited to the donut industry. Some shady online casinos and sportsbooks will use false advertisement to try and lure you in and then under-deliver on their promises. This could be in regards to game offerings, bonus programs, payout limits, literally anything that might entice you in. As you may have already expected, we have a zero tolerance policy with this stuff. If a site is going to lie or try and deceive you with something like this, it's hard for us ever to imagine placing our trust in them. For that reason, false advertisement will reserve a site a cozy spot on the blacklist. It irks us that this is even a thing, but some sites like to try and hide stuff in their terms and conditions that are not favorable to the players. Again, these could be in regards to anything the site offers or does. Imagine that you are getting ready to cash out and you find out that you "aren't allowed to" because you haven't fulfilled some absurd conditions that they have tucked away in their terms of service. This stuff happens, and even though they technically have it in their terms and conditions, it's unethical. Most people don't take the time to read the terms and conditions, and therefore if there is something that customers need to know, it needs to be prominently posted somewhere. Now, our real issue isn't so much with whether or not they have things posted properly. Our real issue is with the terms in the first place. Things should be set up to be fair to both the online casino or sportsbook and the player. We completely understand that sites require some things that players are not going to like. However, there are some things that they are not going to have a choice about. The bottom line is if the site doesn't have their customer's (you) best interest in mind, then we have no interest in them either. We have no issues with companies making small adjustments to their terms as things happen. Sites grow and encounter new challenges that require them always to be making small changes. The key phrase here is small changes. If they are making huge changes to their terms of service all the time, it's a red flag and most likely not something that is happening in your favor. The terms of service (or terms and conditions) for a site are usually fairly long and not something that you probably feel like reading. Imagine if it were changing all the time; it would be impossible for you to keep up with the changes. Even if a site isn't changing their terms often, if they have a history of changing important things without notifying their customers, we aren't happy. This would be like playing a poker game with someone who keeps changing the rules every hand. Whether they tell you about the rule changes or not, it doesn't seem fair to you. This is a huge concern for most people that are skeptical about online gambling. They want to know whether or not the games they are playing are fair and paying out correctly. You NEVER want to be within 100 miles of a site that has issues with being "rigged" or anything like that. Now, to be fair, there have been very few cases of issues with game legitimacy, but we take this one a step further. Not only do we require that a site has games that are legitimate and fair, but we require that they make the proof of that readily available to us and to you the customer. As much as we'd like to be able to just take their word for it, that's not good enough. We want to see proof that they have used third-party auditors to check the legitimacy and accuracy of their systems. Not only do we want to see this, but we want to see this on a regular basis. That's great if they had auditors come in on day one and check things out, but we want to make sure that things 10 years later are still on the up and up. It isn't just a check for sites trying to cheat players; it's a check for systems that may have degraded or have issues. Thankfully, most sites are good to go in this category, but that doesn't mean that we're going to let our guard down. Any sort of issues here is a permanent sentence on the blacklist. If we were talking about the lunch meat, we'd be excited to get Spam from online casinos or sportsbook. The problem is that we're talking about the bad kind of spam - internet spam. Most sites are great about protecting your information and only using it to offer you a better gaming experience. Some sites, though, will sell your information to third parties or send you garbage email that you have no interest in. This is unacceptable. When you give the site your information, you expect it to be kept private and only used for its intended use. Whether sites put in their terms or not that they will or will not send your contact information to third parties is irrelevant. They should NOT be doing that. They aren't some department store that makes money that way. They're an online casino or sportsbook and should act like one. You deserve to be treated like a VIP, and we can guarantee that no company sends their VIPs spam or sells their information. This will instantly land a site on our blacklist. Would you give your personal information to a bank that didn't have lock-tight cyber security? We'd hope not. Would you use your credit or debit card at a store that had issues with getting hacked before? Again, we'd hope not. This brings us to the obvious final question. Would you give your banking information and personal information to an online casino or sportsbook that has issues with cyber security? The answer better be a resounding no. In our opinion, online gambling sites should have the same level of security that banks do. They are handling your personal information and large sums of cash. They need to make sure that they go above and beyond the call of duty to protect this stuff. What's most important is that the sites continue to update their security on a regular basis. Cyber security threats are constantly evolving, and if the sites don't take an active approach to protection, you need to avoid them at all costs. This is a no-brainer instant spot on our blacklist. If you hear something negative about any sort of company, you usually hear it but don't put a lot of weight into it. If you hear multiple negative comments from different people, you start to take notice. This is true for restaurants, stores, car dealers, and pretty much any sort of business in the world. It's especially true for the world of online gambling. In the old days, it was difficult to get feedback on businesses because word of mouth actually meant you had to get it from someone else's mouth. Nowadays, word of mouth means that you can search a few specific places and get instant reviews on a site and any problems someone might have had with it. Now, these complaints must be investigated to make sure they are legitimate and not just a PR campaign to try and bash a good site. If they are substantiated claims, though, the site is going to find itself on our blacklist. We understand that mistakes are made and can forgive them. However, if the mistakes are not corrected and continue to happen, we draw the line. Depending on the severity of the complaint, we may give a little more leeway, or we may see the complaint as too serious of a blemish to forgive. Ultimately, we make a judgment call, and if a site does not live up to our high expectations, they will be blacklisted. While we do our best to keep the above list updated and current, it's impossible to catch every violator in real time before they take advantage of at least a few victims. For that reason, it's important that you know the red flags to look for if you're looking for a new casino or sportsbook. We do everything we can to protect you by providing these resources and accurate in depth reviews, but ultimately it's up to you to be the first and last line of defense. With a little knowledge, you'll be able to spot sites to avoid in no time. The best part too is that with so many options, you don't have to waste your time or take risks with a site if you even have an inkling or a thought they might not be doing everything up to code. Below we've put together a few things that you should be on the lookout for to protect yourself. It's important to note that these DO NOT necessarily mean there is anything wrong with the site. These are just some blanket things to look for that should raise concern and get you to dig a little bit deeper. Some of these things may be completely legitimate, and you don't want to miss out on them just because it's on this list. There's the famous phrase that if something is too good to be true that it probably is. While there are some great promotions and offerings available from online casinos and sportsbooks, there is obviously a limit as to what they have to offer. At the end of the day, they still need to make some money and can't do that if they're giving away an absurd amount of free stuff. It's important to note that you need to be careful with this one because there are times that legitimate sites have run legitimate promotions. This could be because they are trying to acquire new customers or could be a brand new site that sees it as a marketing expense. The point here is to not run away from every great promotion you see. Do some homework and make sure it looks to be legit. Make sure the terms and conditions of the promotion look good and that the site is not on our black list. If that's the case, then you're good to go. We've already stated how important security updates were. While you may not be able to see all the security updates happening, you can see any updates being made to the interface, website, downloadable client, or the promotions. The key here is this. If you see a site constantly making some sort of updates, it means they are still invested in the company and are actively working to make things better. This probably means that they're taking care of the security side of things and want to make happy customers. The flip is the more important one here. If you haven't seen updates or any new promotions or anything in months, it may be a red flag. Even if there is nothing wrong with the security or anything like that, it's still lazy. We want to play and bet at sites that are constantly innovating and offering new and exciting promotions and upgrades. We want new games and new ways to win and make money. The bottom line here is that no updates for an extended period of time could be a red flag. Even if nothing is wrong, you want a site that cares more about you and their company. This should probably be number one on this list, though, we didn't choose to rank them in any specific order. If something feels wrong to you, there's a good chance that it is. The second anything smells off, start doing your homework and find an answer before you proceed or take your money to a different site. There are so many options that it would be silly to stay somewhere you aren't completely comfortable. Again, there is a flip side of this that you need to be aware of. If you're brand new to online casinos and sportsbooks, things are going to naturally feel weird. Things will be a little different than they are in a traditional brick and mortar casino. Sites will also be trying to innovate, and great sites will be doing this often. Don't let that scare you away from a great casino or sportsbook. What we're referring to with this red flag are things that feel off AFTER you understand how everything conventionally works. You may get this red flag often in your gambling career, and it may not ever be anything to be worried about. We're just saying that you should always err on the side of caution and not ignore that little voice inside your head. Hopefully, you've taken a few minutes to read the reasons above that we add sites to our blacklist. These are the keys to identifying and spotting sites that put you and your money at risk. Looking out for red flags is a must, but looking out for the actual infractions is even more important. If you were a department store security guard, would you be more concerned with someone that looks like they might be stealing or someone running out the door with stolen shoes? Hopefully, that analogy makes this tip crystal clear. If you see a site doing something that's not above board, you need to run for the hills immediately. Don't give them a second chance. Get your money off if you have any on there and start spreading the word. Heck, we'd love it if you came back and commented below about anything that you see so that we can add that site to our list if we haven't already. We're all in this fight together and need to do our best to look out for each other. Can a Site Move Off the Blacklist? The short answer is yes but only in the rarest of situations. There are times that with new ownership or through acquisition, a site can turn around their practices and move to being a reputable site. We've seen this a few times, but more often once a site hits the blacklist, it's a lost cause never to be heard from again. Another important factor here is what the infraction or reasoning is that the site was blacklisted in the first place. If it has anything to do with defrauding or stealing from clients, there is no coming back from that. There are certain things that we just can't give second chances for. If it happens to be a "smaller" infraction like constantly changing terms/spam/or complaints, there is slight room for the site to move back off the list. However, this is not easy and is not done by just remedying the problem as you might expect. We need the site to go above and beyond to show us that we don't have to worry about this issue happening again. For example, if a site gets blacklisted for sending out spam. If they just tell customers, they won't do it again, that's not good enough. We want official changes to their terms of service that it will never happen again as well as action to try and stop the current use of your information. We view some infractions as "misdemeanor" crimes and some as "felony" crimes. If you're not familiar with the criminal justice system, misdemeanor crimes are lesser crimes with lesser punishments and felonies are the opposite. The bottom line is that all of the infractions that we view as felonies (anything to do with defrauding you or taking money out of your pocket) are no second chance ones. The misdemeanor crimes have the potential for retribution depending a lot on the intention of the site. If they did something with malicious intent, it's a no go. If they did something because they weren't thinking straight and it was an honest mistake, we would potentially allow them to slide off of it. For example, let's say a site has past history with slow payment. If this is because they were lazy and didn't have good processes that are now fixed, we can find forgiveness. If this is because they were meddling in player's funds and spending your money, it's a no-go.